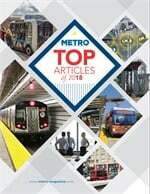 WASHINGTON, D.C. — The Washington Metropolitan Area Transit Authority (Metro) reached an agreement with an independent safety overseer on the testing of the transit agency’s new generation of subway cars, ending a dispute that had threatened to delay the scheduled January debut of the cars, the Washington Post reported. The chair of the Tri-State Oversight Committee, which monitors Metro’s operational safety, told the transit agency last month that she was not satisfied with the safety-certification process it was following as it prepared to put eight of the new railcars into passenger service early in 2015. For the full story, click here.